North Sanpete High School teacher and counselor, Ben Cox, teaching his students the college-level class English 1010. As part of the school’s new implementation of a weighted GPA system, college level classes such as the one Cox teaches are worth more grade points than regular and even honors-level classes. For example, a B grade in English 1010 would be the equivalent of an A in a less academically challenging class. MT. 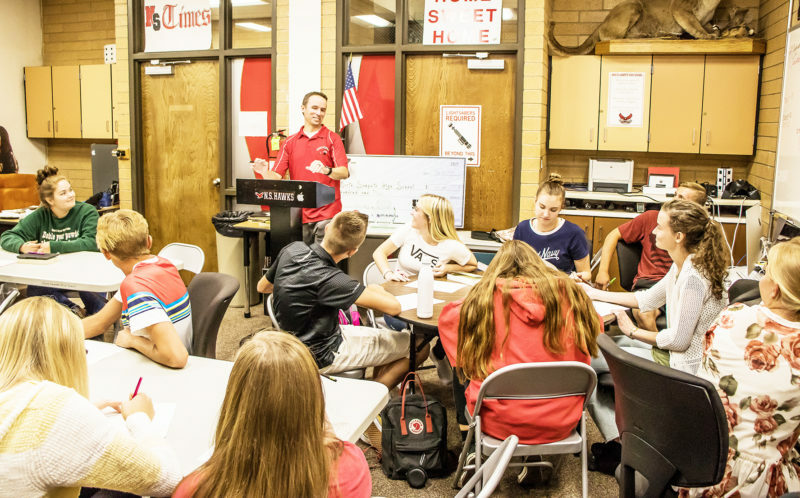 PLEASANT—To get in line with university requirements and encourage students to take more challenging classes, the North Sanpete School District (NSSD) is changing how the high school GPA system works. The new to NSSD program, known as a “weighted GPA,” is already in use in other schools around the state and nation. When Superintendent Dr. Sam Ray was teaching at Provo High School years ago, some schools were using a weighted GPA because colleges and universities needed it to effectively judge a student’s academic merit. Ray says he has wanted North Sanpete High School (NSHS) to use weighted GPA for a while now, and this year it’s finally happening. Ray says it all boils down to a phenomenon that happens with many students who feel pressure to obtain a 4.0 GPA. Students assume a high GPA and good scores on the ACT are keys to getting into a good college, but it’s more complicated than that, Ray says. “Colleges have realized for a long time that some kids take really hard classes and some kids only take really easy classes, so to them a 4.0 GPA doesn’t really equal a 4.0. Ray says grades have traditionally been scored on a 1-4 scale at NSHS, with a 4 equaling an A grade. Honors classes get a slight boost, going up to 1.5-4.5, but with the implementation of the weighted GPA program, college level classes like English 1010 are scored at 2-5 grade points for passing grades with an A grade earning 5 grade points in a student’s weighted GPA. Concurrent enrollment classes taken through Snow College are also now worth up to 5 points on the expanded 2-5 scale. Under the new system, a student who gets straight As in regular classes still gets a 4.0. But if a student gets straight As, and his or her schedule includes honors, concurrent enrollment or a college class, the student’s grade-point can go above a 4.0, such as 4.2 or 4.5. Ray says it’s not about making it harder for students to earn a top GPA. It’s about giving them incentives to prepare for college at an early age and challenge their academic determination to distinguish themselves from their peers when they get to college. “The research is very clear that the most important thing as student can do to prepare for college is to take a college level class while they are still in high school,” Ray says. “It doesn’t matter so much if they get an A, it’s that they’ve had that experience. But there is an extra bonus for students to take these harder classes. Snow College has begun a scholarship program called BadgerTracks. It works in harmony with the NSSD philosophy of encouraging college level classes during high school. 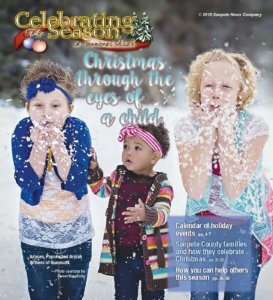 Ray says the Snow program can’t be combined with other scholarships, but if a student completes 12 college-level credits with an average of a B grade before they graduate from high school, Snow College reduces student tuition by $500 (approximately. 33 percent of full time tuition costs) for each semester they attend. In addition, according to the BadgerTracks website, students who have been taking concurrent-enrollment classes through Snow College and have maintained a 3.0, won’t even have to apply for admission to Snow their freshman year, because they’re already considered Snow students. Ray says compared to other schools, NSHS has fewer students taking college-level classes. 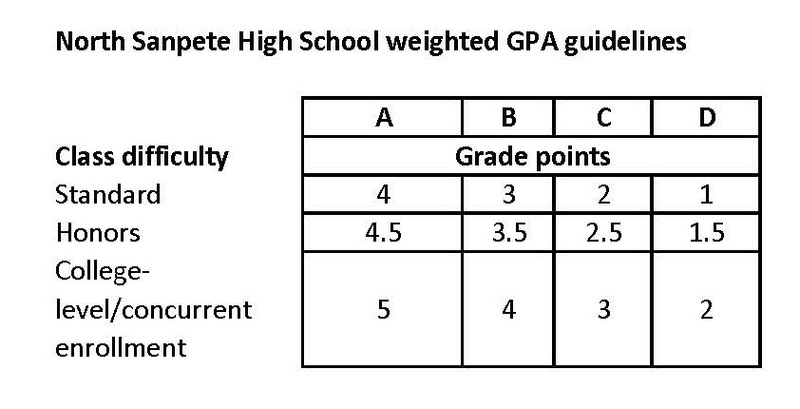 He hopes the weighted GPA system along with BadgerTracks will be enough incentive for them to try their hardest, even if it means getting a B instead of an A. “A lot of colleges ask for both a regular GPA and weighted GPA,” Ray says. “A lot of transcripts list both and a lot of schools publish both. Ray says he aims to stamp out that perspective, and the new weighted GPA is a step in that direction.